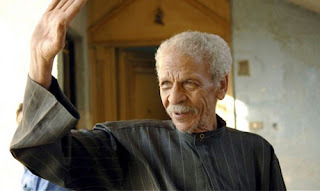 The death of Egypt’s iconic slang poet, Ahmed Fouad Negm, 84, on Tuesday morning marks not just the passing of a man, but a phenomenon in the genre of political poetry, a field he dominated for over four decades. Along the way, he gave voice to his country and the working class. His funeral at Cairo's historic Al-Hussein Mosque was attended by family members as well as hundreds of fans, including eminent leftist political figures such as Hamdeen Sabbahi and Khaled Ali, candidates in the 2012 presidential elections, and Mohamed Abul-Ghar, head of the Egyptian Social Democratic Party. The author of famous poems like The Brave Man is Brave, Negm, known to his followers as Al-Fogammi, seemed to embody the Egyptian protest spirit from the early 1970s until the moment of his death. Just as he never strayed very far from Egypt's political and economic concerns, he also never avoided controversy, which he encouraged with both his poems and statements about religion. A sharp-tongued poet, his bold statements against political and cultural figures made him plenty of enemies and often landed him in jail – most notably an 11-year-stint in prison for mocking the television addresses of President Anwar Sadat. Negm said that he never felt old or wrote like an old man. Last year, in a statement to Al-Jazeera English, he claimed, "I still write like I'm 25, eat like I'm 25, and please a woman like I'm 25." Two months before his death, he received the prestigious Prince Klaus Award from Denmark, in recognition for his poetic contributions that inspired three generations of Egyptian and Arab youth. In his poems, Negm merged social and political anger with the cynicism and sourness of the oppressed working class. Negm was born in rural Sharqiya in 1929, one of 17 other boys in the family. Conditions in his village were harsh – six of his brothers died. After the death of his father, he moved to Zagazig to live with his uncle. Shortly afterwards he was placed in an orphanage, where, in 1936, he met the iconic Egyptian singer Abdel-Halim Hafez. Ahmed Fouad Negm first began writing in the 1950s after he had been jailed under false accusations of counterfeiting. He was still in prison when his first collection of poetry was published, Pictures of Life in Prison, which was instantly heralded as the voice of a new poetic talent. The book would go on to win first prize in a poetry competition organised by the Egyptian council of arts. In 1962, Negm met the famous musician and composer Sheikh Imam Eissa. Over the following years, they become the most successful duo of the time, with Eissa singing his poetry. At first the songs were romantic, but after the 1967 war with Israel, the lyrics became political. The authorities soon took notice, giving both of them a life sentence in prison. President Sadat referred to Negm as "the abusive poet." Ahmed Fouad Negm continued his political struggles, however, by opposing President Hosni Mubarak over the years. He was also against President Mohamed Morsi and the Muslim Brotherhood. He remained at the heart of Egypt’s political scene until the very end of his life. Speaking at a poetry gathering in Amman, Jordan, just three days before his death, Ahmed Fouad Negm proclaimed the 30 June anti-Mohamed Morsi protests to be the start of a new revolutionary wave. However, he rejected the idea of General Abdel-Fattah El-Sisi running for president.